Gov. 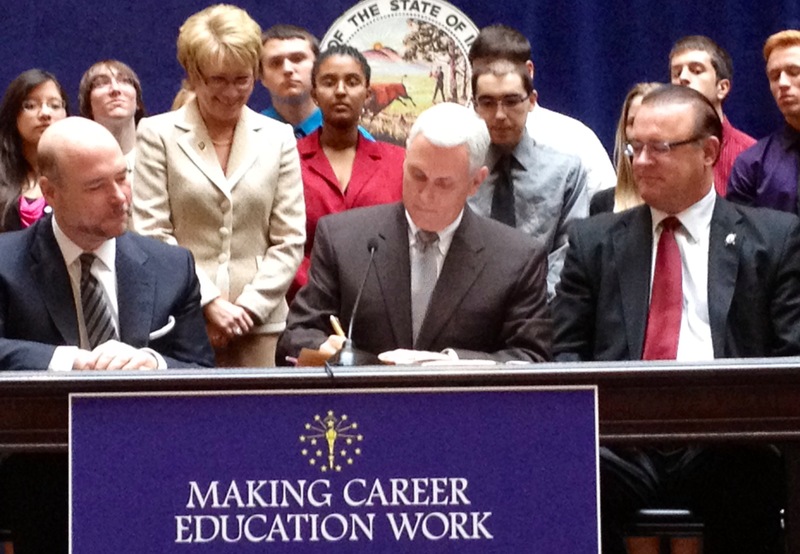 Mike Pence signs a piece of career education legislation at the Statehouse Monday, as (from left) Indiana House Speaker Brian Bosma, Lt. Gov. Sue Ellspermann and Senate President Pro Tempore David Long look on. House Minority Leader Scott Pelath was present, but is not pictured. 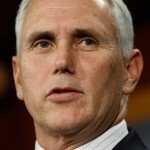 “The bills I sign today will ensure that our schools work just as well for our kids who want to get a job after high school as they do for our kids who want to get a college degree,” said Pence, who often spoke about improving job training in schools on the campaign trail. The first bill creates regional Works Councils that will work with the private sector and educational organizations to identify needs in the area’s workforce, create partnerships between schools and businesses for internships and apprenticeships and boost career and vocational ed in high schools. The other creates a state career council to bring all of the state’s job creation and education efforts together at one table. Pence says the combined initiatives will help ensure schools work just as well for students who want a job out of high school as those who attend college. “With more relevant career and technical education in our local schools, we’ll encourage more Hoosiers to stay in school and finish school and set more of our kids on a path to success in high school and beyond,” he said Monday. Pence says strengthening career and vocational education in high school will help the state attract new investment and create more jobs. 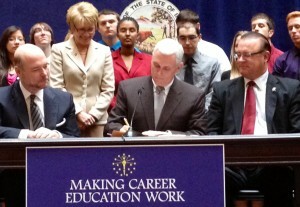 Pence says more relevant career and technical education will help reduce dropout rates.